Pokemon Pets lets you collect, train and battle with your favorite Pokemon! It's a free online RPG with people playing all over the world! Strive to become No:1! Whether in collecting or PVP! 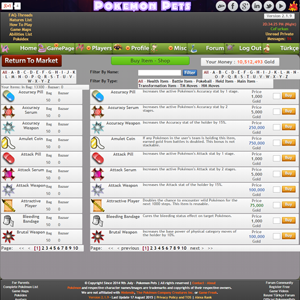 Pokemon Pets is an absolutely free Online RPG! (Absolutely no cost!) Play the game online in your browser, no plugins or downloads! Some of the features in this game include : Exciting live PVP battles, Challenging NPC trainers and fearsome gyms! Featuring over 520 maps, very fluent game play, Private messages and an easy to use market system! Over 2500 unique Pokémon from fakemon, fusions and much more! Each Pokémon is unique thanks to our EV and IV systems! Collect your favorite Pokemon from the original games or partner up with some of our exciting new fakemon composed by our community! Please check below for all of our features! There are 3 types of buildings that you can enter: Monster Centers (equal of Pokémon Center), Shops and Arenas. To go into a building, simply move upward through the doors. The first type is the Monster Center, where you can heal your team and modify your team. The second type is the Shop, where you can buy and sell items and Pokémon, as well as trade Pokémon and stuff with the others online players! The third type is the Monster Arena (like Pokémon Gym Arenas), where you can challenge strong NPC trainers to obtain Pokemon Pets badges, Mythical Tablets and awesome stuff! Wild Pokémon can be found by walking through the tall grass areas on each of the maps. Appearance of the grass might be slightly different according to the different zones. When you point the mouse on another player's sprite, a menu will appear. This menu gives you two choices: you can view the other player's profile or challenge him/her to a live PvP battle. Pokemon Pets has a easy and advanced navigation system. The R button is a shortcut to flee the wild Pokémon encountered. The E button is a shorcut to fight the wild Pokémon encountered. The cross on the map are here for your guidance to reach the next map. From maps details page you can see full size of maps so you can easily spot the next location. Some maps may have a cave entrance, so as a result, the GPS tracker may show 3 or 4 different paths. While walking on the Pokémon appearing areas such as grass you will encounter with wild Pokémon. Game screen will show you the Pokémon ID, name and the level. The Pokémon properties get assigned when you enter the battle such as IV values, Nature and abilities. 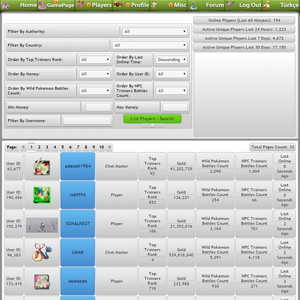 Individual values are similar to IV values at Pokémon online games but with an advanced way. You have 2 options when you encounter a wild Pokémon. You can either try to battle or try to run. You need have a faster Pokémon in your team in order to run. To prevent cheating times to times you may not run even if you have faster Pokémon. 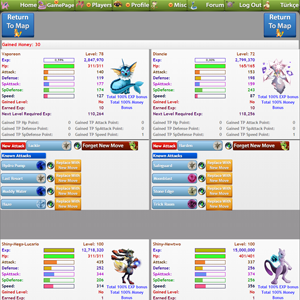 If you hover over Pokémon image you will see its features such as class, total base stats and types. 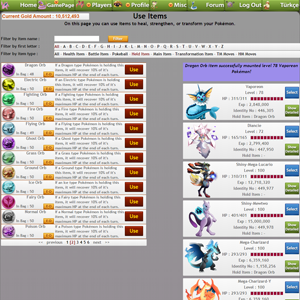 If you click right bottom little dex item it will open Pokédex page where you can see Pokémon details such as moves, default abilities, ability pool, drawing artist, type effectiveness and so on. First three boxes are nets (Old Rod, Good Rod, Super Rod). You need to buy nets from the market first in order to use. Stand near water areas and click net items to use quickly. It will search for net appearing water Pokémon. 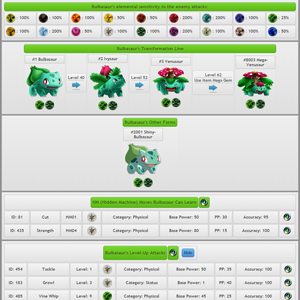 At items page you can use items to heal your Pokémon or make your Pokémon stronger and transform some of your Pokémon (like evolution stone in Pokémon games to evolve Pikachu to Raichu). The three mini Pokémon icons is a short cut to see your Pokémon team page. 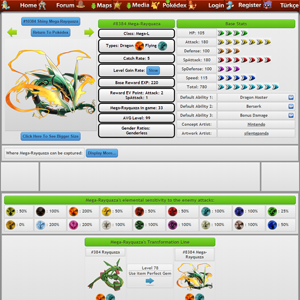 At Pokémon team page you can transform your Pokémon or release them to the wild or see their details. At maps details page you can see appearing Pokémon Name, Class, Min Level, Max Level, Average EXP, Average Gold, EV Reward (like EV values in Pokémon but advanced), Appear Chance. Also the appearing Pokémon features you can see the trainers those maps contains, NPC trainers features and the rewards they are giving. There is also shortcut icon to the Pokedex page. Surface type is really important. At some surfaces Pokémon do appear such as grass areas are Pokémon Habitat, Cave Surface etc. We have 19 zones, each zone has its own type, the last one is a mixed type. Mixed zone is the hardest one with the strongest wild Pokémons and the most ferocious NPC trainers. Also at each update which new Pokémon added, we re-roll all Pokémon and NPCs on the maps so it is like a brand new game at each update. 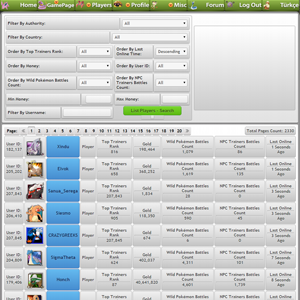 Pokemon Pets has a very advanced live battle PvP system. Pokemon Pets has a specially coded chat screen and it is integrated to the game. 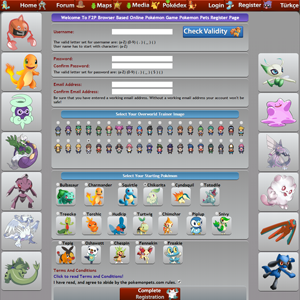 Once you click battle button you will get redirected to the Pokémon selection page. 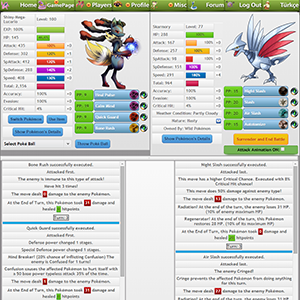 At this page you can see your Pokémon details in order to choose who will fight the enemy Pokémon. Pokemon Pets one another great aspect that differst it from other Pokémon online games is that you can give pet names to your tamed Pokémon. Because we keep information of every Pokémon that is captured by people. This make Pokemon Pets far more advanced than other Pokémon MMORPG games out there. 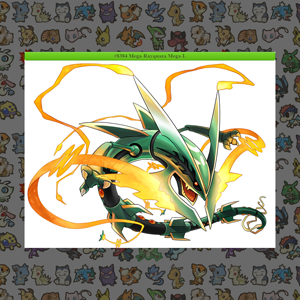 At this page if you click Pokémon image it opens the Pokémon details page. 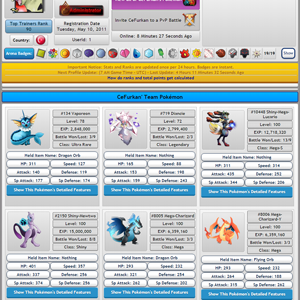 Pokémon details page displays all information about that particular Pokémon and also you can name your pet Pokémon there. 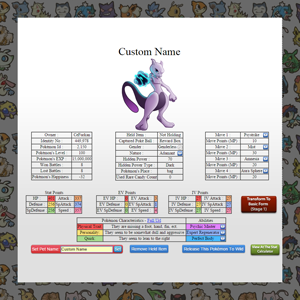 Also if you want your team Pokémon get ordered enter the number from small to big and click save button. 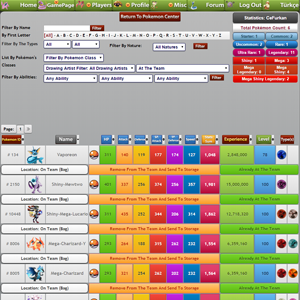 Battle page of Pokemon Pets is the actually most advanced section. When you are battling with wild Pokémon, you can catch them with throwing Poké Balls. Both using items and Poké Balls are disabled when PvP'in and at NPC trainer battles including Gym leaders. Status effects, abilities, hold items changes your Pokémon stats. Each attack has power points (PP) similar to PP in Pokémon games. 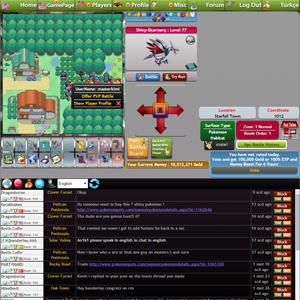 At Pokemon Pets you can even see any Pokémon details completey which is a unique feature that other Pokémon MMORPG games doesn't have. 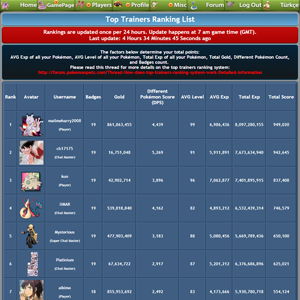 This is Pokemon Pets battle result page. You will get to this page after each NPC trainer battle or wild Pokémon battle if you defeated the enemy Pokémon. At this page your Pokémon will learn new moves. You will gain only gold and exp from wild Pokémon battles but you may gain item rewards from NPC trainers battles. You will also gain EV points after each battle. Per stat 4 EV points increases stat value. Per stat can have EV points up to 252. Maximum total EV points can up to 510. 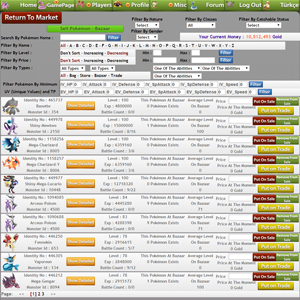 And finally Pokémon trade/sell history page displays all Legendary and Shiny Pokémon trades and sell events to prevent real life money, sell, trade and hacking other accounts. My items link open your item inventory and you can use items there and transform certain Pokémon. 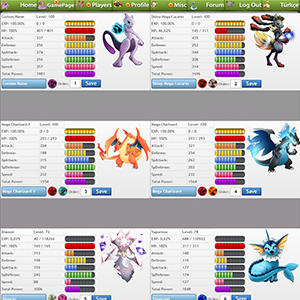 My team page opens your Pokémon team and from there you can click to see your Pokémon details and also release them to the wild. 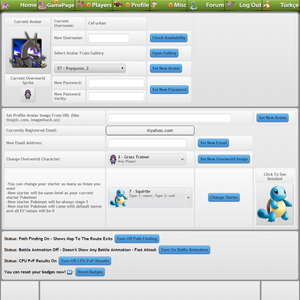 Control panel is another very important page where you can change your password, email, starting Pokémon, username, overworld sprite avatar, profile avatar. Pokédex opens Pokémon Pedia page. 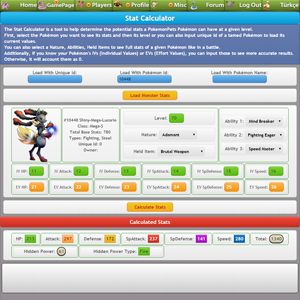 The stat calculator helps you to evaluate the final power of your Pokémon when it will reach level 100. You can add the amount of EV and IV allocation in order to get a precise idea of the final stats of your Pokémon. 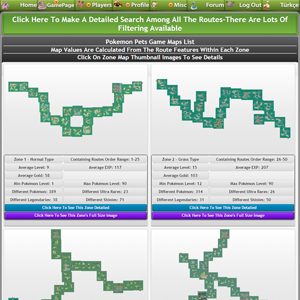 All Pokémon opens a special Pokémon displaying page where it shows relatively big Pokémon images with a lot of filtering features. 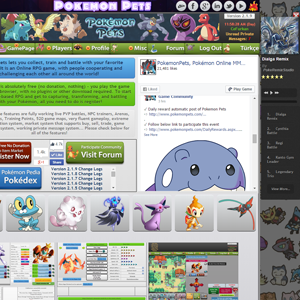 At this page you can quickly and easily take a look at Pokemon Pets Pokémon. 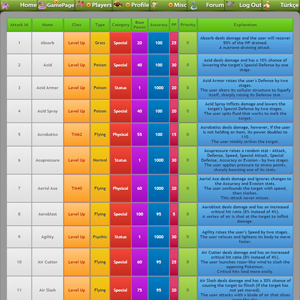 Moves list shows you all the moves availaible on the game, of all the Pokémons. More than 514 moves in total! 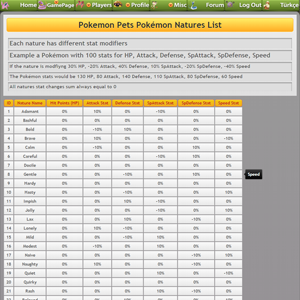 Nature List opens nature page where you can see PokemonPets Pokémon natures and what do those natures do. 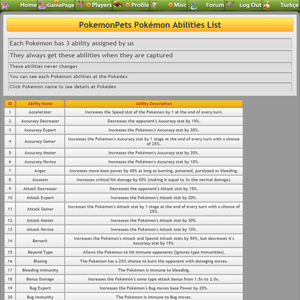 Abilities List opens ability page where you can see PokemonPets Pokémon abilities and what do those abilities do. 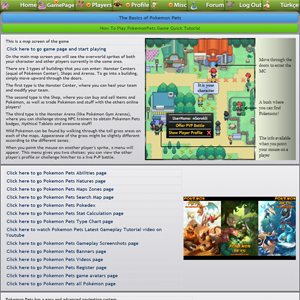 Game videos opens video page where you can see PokemonPets gameplay tutorial videos and other related videos. Game screenshots opens screenshots page where you can see PokemonPets gameplay screenshots. 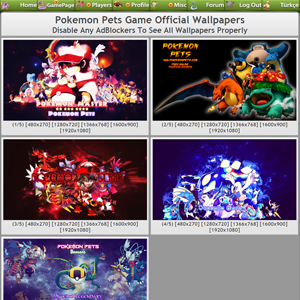 Game Wallpaper HD shows you awesome wallpapers from Pokemon Pets that you can download and put in on your computer! 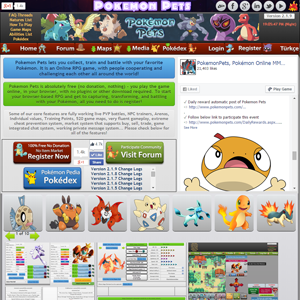 Game Banners opens banners page where you can see PokemonPets high quality banners and logos. 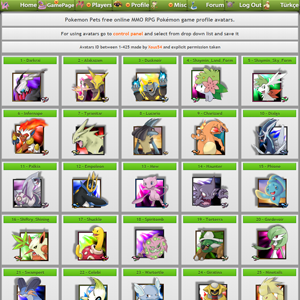 Game avatars opens PokemonPets profile avatars page. 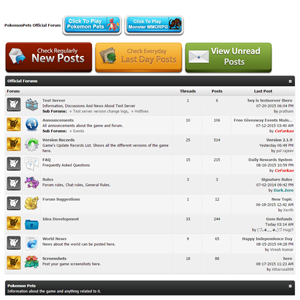 Pokemon Pets has over 600 high quality game profile avatars which you can use in game at your profile. Poké Balls are very important to new players. Poké Balls are used to catch wild Pokémon. They can be obtained via Pokemon Pets Shop buildings. Click Poké Ball filter to display only Poké Ball items. 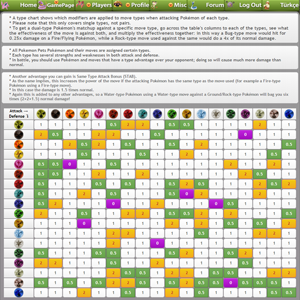 By clicking the Pokéball section, You'll find various Balls, though choose Poké Ball as a beginner. Then you can use these boxes to catch wild Pokémon at the battles. 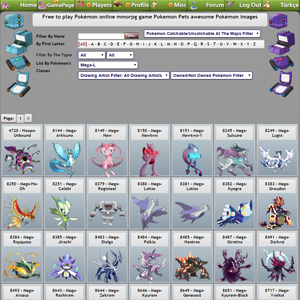 In order to transform your Pokémon to another stage first visit your Pokédex page. 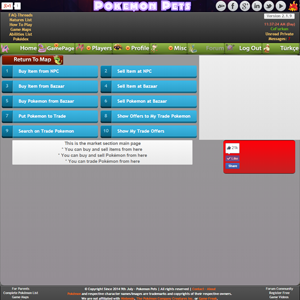 Go to Pokédex page and type your Pokémon name to Filter By Name box and click filter button. 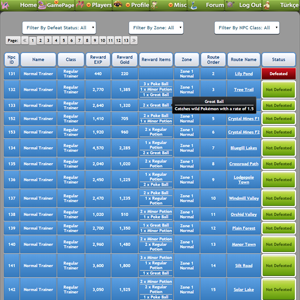 Once you entered 2 letters or more it will start populating Pokémon names so you can easily select. 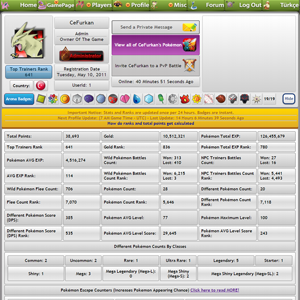 Once filtered click Pokémon name and open Pokémon details page. At there hover a bit lower and you will see Pokémon stages (if it has other transformation forms) and what is required for next stage. Once your Pokémon satisfies next stage hover over profile tab and click my team. Once page opened click transform Pokémon button and at the below you will see either successfully transformed or missing requirement. Example of Eevee: To evolve it into Espeon, you need a magic gem. In order to do it, go buy a gem in the shop, then click on "My items" in My Profile section, and "Transformation items", finally click on the corresponding gem, and click on the Eevee! You can also change your starter Pokémon as many as times you want. -> HM items that can teach stronger moves to you Pokémon. -> Regional chat box allows you to talk with other players about the game in your own language - supported language count: 32. -> Live PVP (Player Vs. 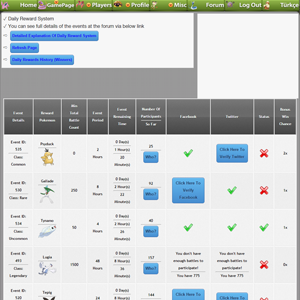 Player) system that allows you to battle with other trainers online. -> Strong game hosting server that allows you to play the game with no lag. -> Fair gameplay environment that is rare on other online games and Pokémon mmorpg games. -> EV (Effort Values) allow you to customize the growth of your Pokémon. -> Game development with latest technology that allows for more security and a faster gameplay experience. -> No download, plugin or toolbar required in order to play the game. All you need is a good browser like Mozilla Firefox or Google Chrome. -> Logically-designed top Trainers ranking system that prevents players from abusing statistics to increase their rank. -> Advanced battle mechanics, including type advantages and unique effects like Poison, Cringe, and Trapping. 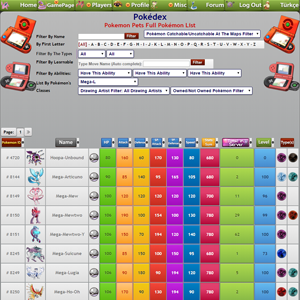 -> Full-featured Pokédex, containing ALL the information on ALL of our Pokémon! -> A slew of contributor artists (Credits) means that the game will continuously have new content. -> 7 different Pokémon classes: Starter, Common, Uncommon, Rare, Ultra Rare, Legendary, Shiny - make the game more challenging. -> Use varied transformation methods to make your Pokémon more powerful. -> Each of the 19 elemental-based zones has an arena to defeat and a badge to earn. -> More than 100 items that you can use both in and out of battles. -> No daily limitations that force you to buy items with real money. -> No two Pokémon the same with official Pokémon natures and IV, EV system affecting stat growth. -> Reliable game future that you cannot find on other fan-made online Pokémon games. -> MT items that can teach new moves to your Pokémon. -> Many, many more unique features just waiting to be explored! -> You can change your starter at any time from your control panel. -> Unique, high-quality digital artworks instead of the commonly-used Pokémon game sprites. -> 75+ over world character sprites. -> Pokémon locations change every update, giving you a new gameplay experience with each update. -> Advanced anti-cheating (against macros and other software) protection services that you cannot find on other browser based games or Pokémon online games. -> Advanced search system in every area of the game that allow players to quickly find whatever they are searching for, such as: filtering game maps by Pokémon classes, ordering Pokémon at the Pokédex by any wanted stat, or filtering on sale Pokémon on bazaar by any ability you want. 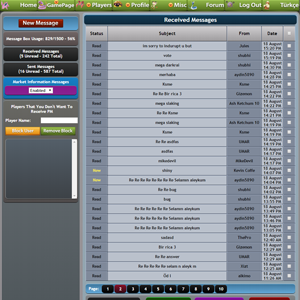 -> Advanced in-game private messaging system. -> Community-driven development that continuously improves the game. -> User-friendly community forum where you can participate in events, share pictures and stories, and learn how to play game. -> Real-time statistics saving prevents any work you do from being lost and lets you continue the game exactly where you left off. -> Customizable in-game avatars avatars that you can use on your profile. 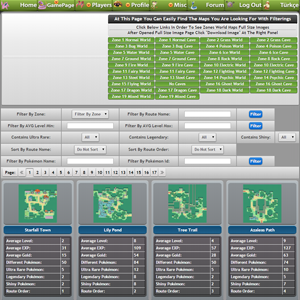 -> 520 detailed game maps, and your favorite Pokémon to battle, capture and train! 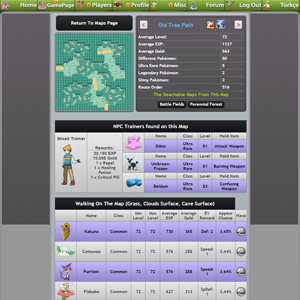 -> Challenge NPCs and search high and low for legendary Pokémon to keep the game interesting. -> Over 5 years of development experience and solid game information safety. -> Mostly working Pokémon attack moves with varied effects and features that you can't find in other online Pokémon games. -> IV (Individual Values) determine the outcome of your Pokémon stats. 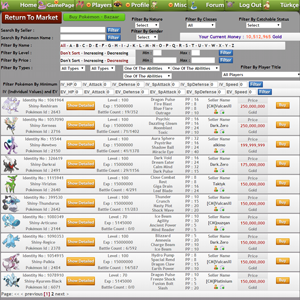 -> Fully functional trade system allows you to trade multiple Pokémon at a time, offer items and money in exchange, or give Pokémon to your friends. -> HM moves that can be used to assist you out of battle. -> Hundreds of Abilities with effects like health recovery, immunity to certain attack types, or inflicting status! -> Held items that allow you to customize your Pokémon power. -> User-friendly games interface that allows you to enjoy the game without complications.